My first experience with big, nay, huge, all-encompassing mountains converted me. I love them. I just wasn’t aware until I landed in Peru and first experienced them. 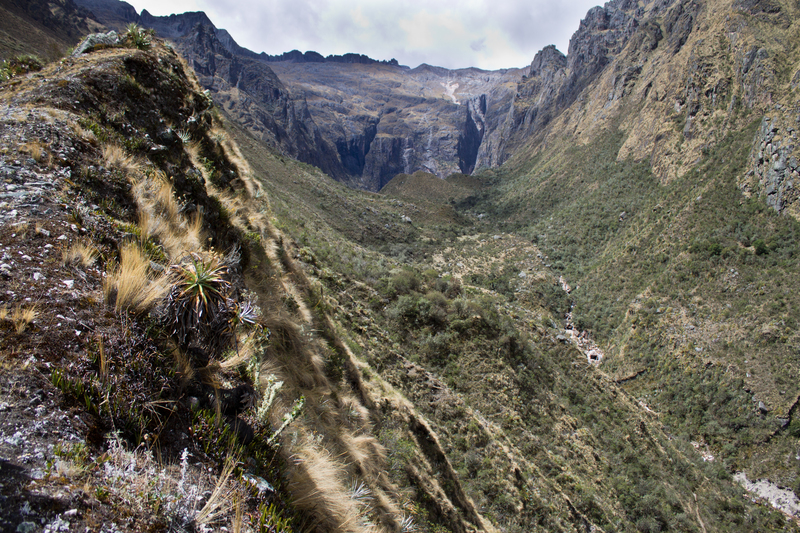 After spending my first week in Cusco, getting to know my host family, finding my way around, and adjusting to my internship, I joined some others on my program for a hike. 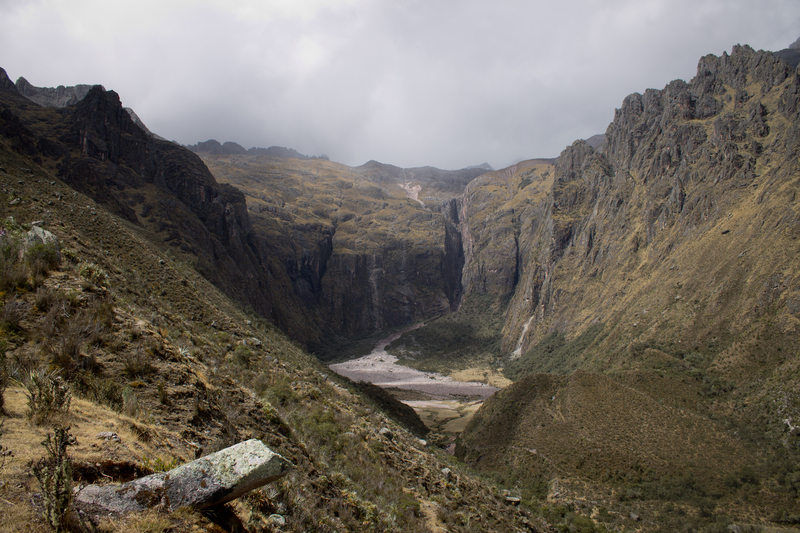 We took a bus to Urubamba, a town in the Sacred Valley, from which we hiked up and up, along a gravel road that wound behind the town, toward views of the Chicon glacier. Our destination was not the glacier, though, but rather an elusive waterfall. 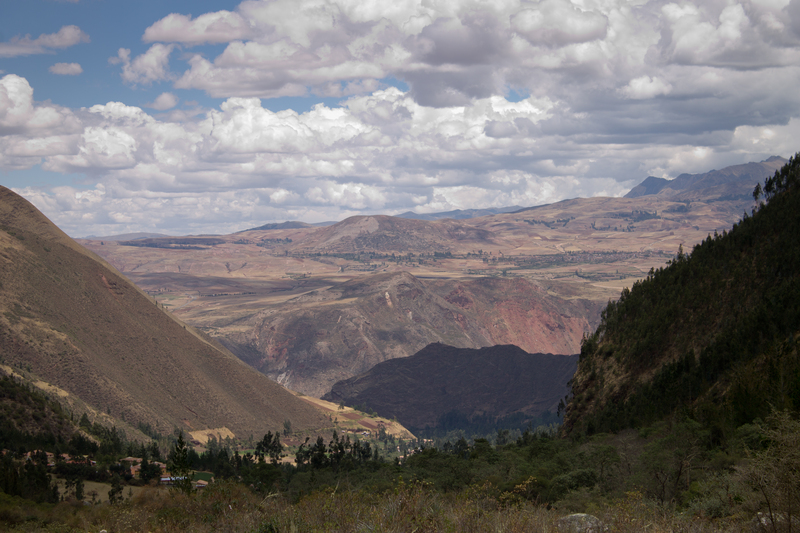 View back down into the Valley, toward Urubamba. The gravel road ended and we climbed along a ridge, skirting prickly bushes and other grabby plants. Despite being in rather good shape, I was puffing heavily. But I wasn’t deterred—if this mild shortness of breath was the worst effect of the altitude I’d experience, particularly during my first week, then I was fine. Besides, the wondrous mountains drove me along. And thus, I decided that I really loved hiking too. I liked it before, but the feeling compounded itself. Ahead of us, a wide valley gradually opened up. It looked as if it has been scooped out like a bowl with a flat bottom among the mountains. This valley, I thought, held our destination. We wound down the ridge, skidding quite a bit in the dust, and made our way onto the open land. A small stream, flanked by rather large boulders, snaked away from us, back into the cliffs. There is where the waterfall must be! The vastness of the landscape confused my perspective and what I thought would be a quick jaunt turned into a hour-long clamber over rocks. Bouldering indeed. My short legs weren’t too happy, and neither were my oxygen-deprived blood cells. I looked up and saw a trickle of water falling from the cliff above us. Here was the catarata I had been told about. It hardly qualified, but there’s dry season for you. The valley with the waterfall in the back. The hill in the foreground can be seen in the previous photo of the ridge, to gain a sense of perspective. In the valley, facing back out. 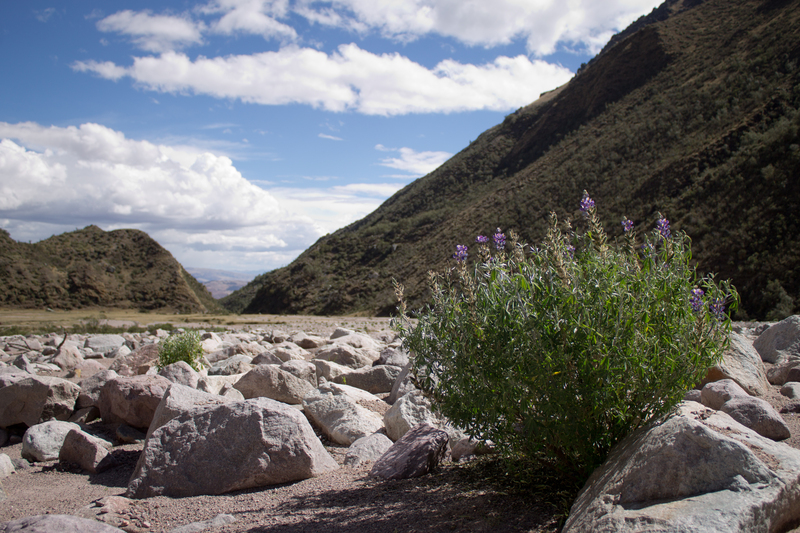 As the sun gradually and unevenly fell over the mountains, we made our way back to Urubamba, opting to slowly descend by the dry-ish riverbed rather than clamber along the ridge. 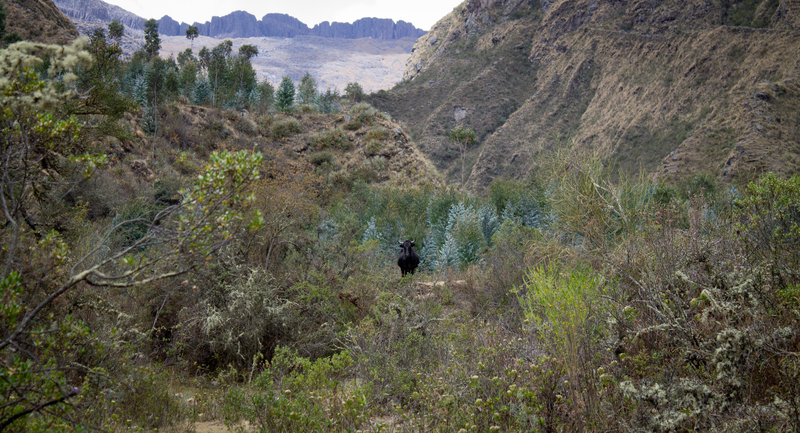 Ducking through those spiky bushes in the dusky light was another challenge, but we made it to the road soon enough and reached Urubamba just as night fell in the valley. 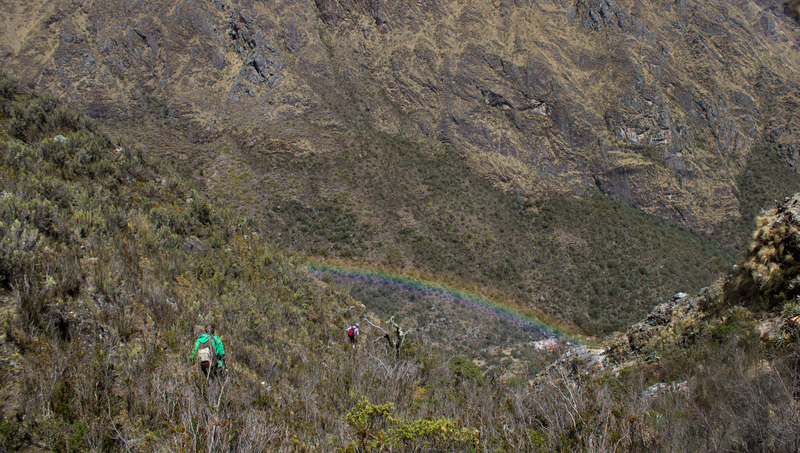 The Sacred Valley, even the area just near Urubamba, is host to a plethora of hiking options, ranging from hours to days long. Almost every hike I heard about from locals or fellow foreigners who were around for the somewhat longer term, so open your ears. If you’re willing to rely on verbal directions from people along the way, the possibilities expand greatly and will take you beyond the tour agency path. Most weekends I tried to take advantage of these opportunities, being a quick addict, but my two plus months in Cusco wasn’t enough time to do all of the hikes I wanted. So, next time, I hope. 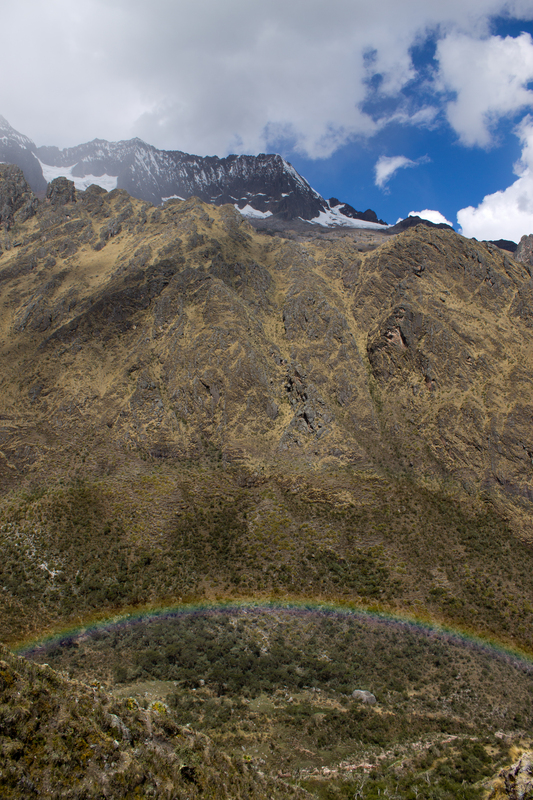 I don’t know of that many places where you can walk level with rainbows. Great photos! This is definitely on my ‘to go’ list.